After all the holiday shopping and red tag sales, I figured I'd start the new year with some red tagging of my own. I'm not planning to get rid of some old posts, but update a classic lean game with a new variant. I wrote about the 5S Numbers Game way back in April of 2010, and it could use a little refreshing. The 5S Numbers Game is a simple pen and paper lean game that can be used while teaching the 5 S's: Sort, Set-in-Order, Shine, Standardize and Sustain. With a little effort, you could easily make your own version. Every person is given a booklet. 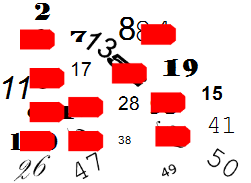 As each "S" is taught, the class flips to the appropriate exercise, where a group of numbers need to be found and crossed off. While progressing through the 5S process, the numbers become easier to find, since they are sorted, ordered, organized, and standardized. There are a number of versions floating around out there on the Internet, but recently I came across this one which incorporates the 5S red tag process. How do you red tag a number on a piece of paper? By slapping a red tag sticker on the numbers that aren't needed! Maybe it's a little much for a simple 5S exercise, but there's a few other tweaks that differentiate this game from the original 5S Numbers Game I posted about, including colour coding for visual control! Now, I understand that doing is the best way to learn. And 5S is one of the easiest lean techniques to learn about while doing. Naturally, we all want to get our teams out there to organize and standardize, but as an introduction to 5S, the 5S Numbers Game is a simple activity that everyone will enjoy. I've used it successfully during kaizen events. A little competition always excites the group. Here's the latest game with the 5S red tag process, embedded for everyone to see. Post a comment if you've used the 5S Numbers Game in your training sessions and tell us about it! I've added this game to my massive list of Lean games and simulations. During a course at the University, as I was a student, we played the older version of 5S game with numbers. It was fun, useful and a great way to remember 5S!